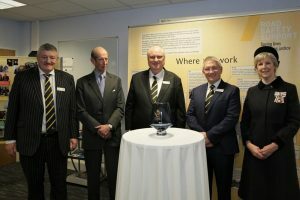 IRF Member Road Safety Support International (RSSi) today received a prestigious Royal business award in recognition of the company’s efforts to reduce road casualties across the world. Formed in 2008, RSSi has worked in countries in North America, South America, Asia, Europe and the Middle East. In the UK, Road Safety Support provides assistance to the majority of police forces, highway authorities and safer roads partnerships in England, Wales and Northern Ireland. The company’s UK activities are supported by the work of RSSi. The Queen’s Awards, which are regarded as the most prestigious of their kind in the country, are awarded each year to businesses for outstanding achievement in four categories - International Trade, Innovation, Sustainable Development and for Promoting Opportunity. The award presentation event was also attended by guests including HM Lord-Lieutenant of Essex, Jennifer Tolhurst; Simon Hall MBE, High Sheriff of Essex; Pippa Mills, Assistant Chief Constable of Essex Police and Councillor David Harrison, Mayor of Basildon Borough Council. Trevor Hall, Director of RSSi, said: “We are delighted that the hard work, dedication and commitment of our staff has been recognised. Each individual who works for us has one focus; that is to reduce the number of people being needlessly killed on the roads." He added: “To each of us, this is more than just a job; keeping people safe on the roads is something we truly care about. By working with and supporting police forces, government and third sector organisations both nationally and internationally, ultimately we are supporting people and communities.